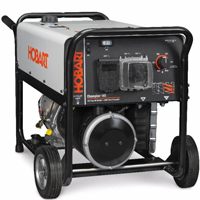 The Champion 145 Welder/Generator offers 4500 surge watts of AC power, making it an excellent choice for emergency backup or for powering hand tools, grinders, lights or battery chargers. The versatile receptacle package features four 20 amp, 120 VAC GFCI receptacles and one 240 VAC (6-50R) receptacle, all with covers. Weighing in at 222 lbs, the Champion 145 includes running gear and has a durable roll bar frame for added protection. 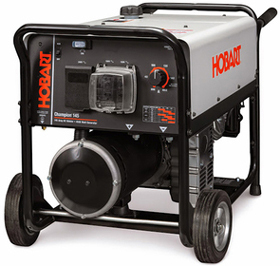 This lightweight and compact welder/generator features a 6.25 gallon gas tank for long run times weld at 75 amps or use 2500 watts of auxiliary power for 12 hours. The unit provides up to 145 amps of DC welding power, offers exceptionally smooth arc-starting capabilities and can accommodate stick electrodes up to 5/32-inch diameter.